Danelectro DJ21 Black Coffee Metal Distortion from Mini series. Made in china around mid-00’s. Finishing up with the Dano mini series with the last unit. With this one i’ve finally covered each and every one of these plasticky things. Some were surprisingly good, some very decent to say at least and some were.. Well. Not that great. It’s been an interesting journey, neverthelessx. 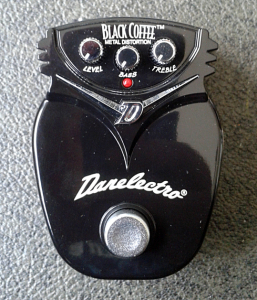 Black Coffee is the straight on metal distortion of the series. Straight on and nothing else. Like many others in the series, construction is all SMD on two stacked boards. Design consists of thee dual opamps and couple of transistors. 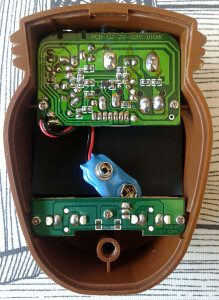 Quick search on it shows that user Bernandduur has a traced schematic up at freestompboxes.org forum (you require an user account to see it). The main thing about the design is that the circuit is pretty close to Fab Tone from the original series. No gain control when compared to its predecessor, it’s just fixed at maximum setting. That equals to a lot of gain. Tone controls are gyrator for lows and variable low pass for highs. Decent design and it doesn’t hurt that it’s not a straight on copy of some other brand’s design. 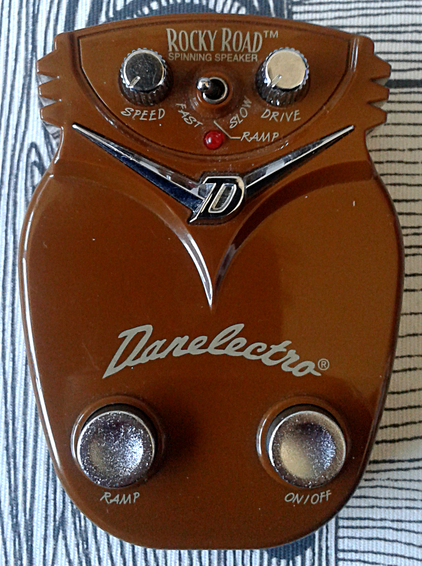 So we have our level, lows and highs controls with standard Danelectro electronic bypass switching. EQ is rather powerful, but it has nothing on Boss HM-2 and HM-3. 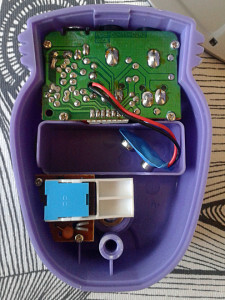 Even mentioning those two in this post feels wrong.. Biggest downsides come from the plastic housing, switching and.. Sadly, not that great. I think the value differences and other slight changes between this and the Original series Fab Tone are enough to put some distance between the tones. Gain content and decent metal style hard clipping or wave folding elements are where they should be, but something makes this just sound and feel hollow and empty. Lack of true low boom is the biggest culprit in its sound. That doesn’t appear to be missing from the Fab Tone, so i think it’s safe to assume that all of the component values aren’t the same between the two. This sounds like a fine plastic toy, but it is still a rather dull one trick pony. Not totally awful. But there are number of better sounding death metal tones for the same price around. And those aren’t plastic nor do those feel like it. I’d say this one has collector value only. 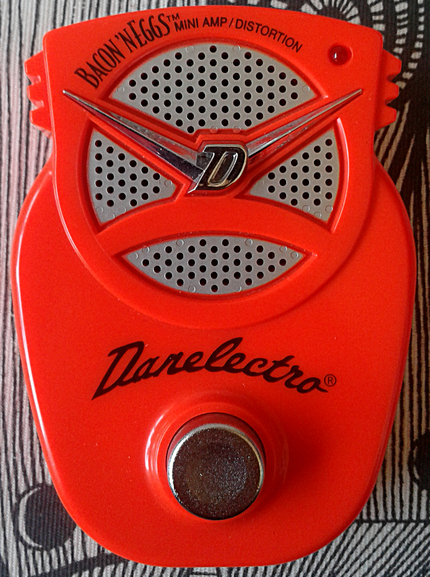 Danelectro DJ-20 Rocky Road Spinning Speaker from Danelectro Mini series. Made in china around mid 00’s. Leslie simulators are one sub-genre of effects that i haven’t had a lot of interest on. Is it a tremolo? A vibe? A Chorus? No. It’s a Leslie simulator. Which translates to it being a tremolo, vibe and delayless chorus. In essence, it is a amplitude modulation effect, designed to give you a feel of a spinning speaker-like illusion. Sort of like a stereo tremolo/vibe that goes ping-pong. In fact, a Leslie simulator is nothing more than a marketing scheme. Rarer the idea for the pedal, the better chance to sell them. 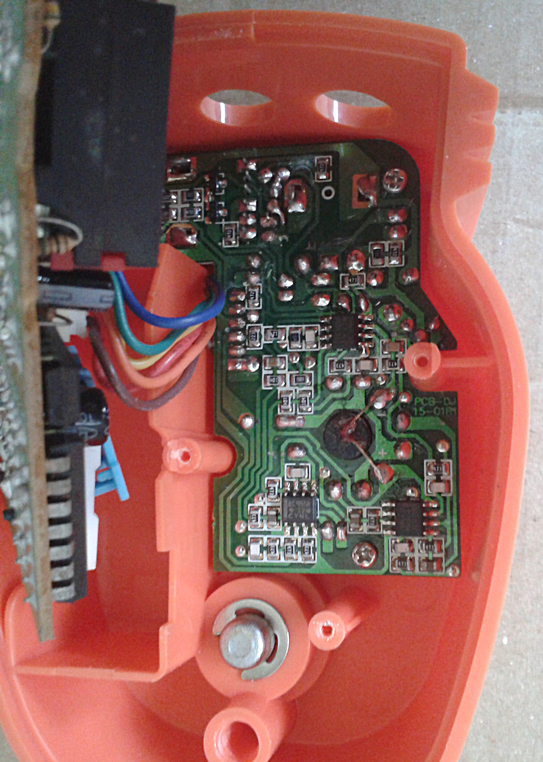 On the technical side, the effect is created with a HE83015 8-bit micro-controller. There is a schematic for the complete circuit on the builder forums (you’ll need to log in to FSB to see it, so no link at the moment). Basically we have a overdrive/distortion that’s given to the programmed digital controller for amplitude modulation in stereo (or that’s how i read it). 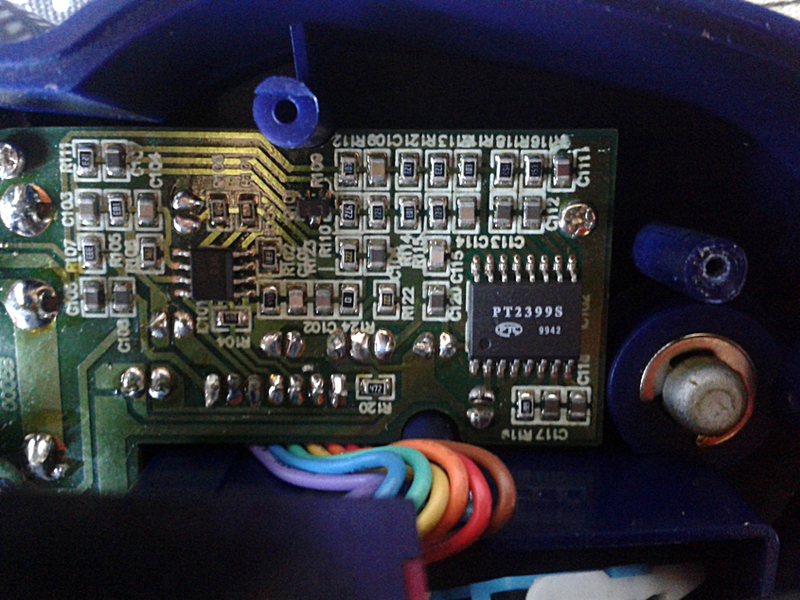 And once again, my shortcomings in the area of digital micro-controllers prevent me from digging any deeper. For now. 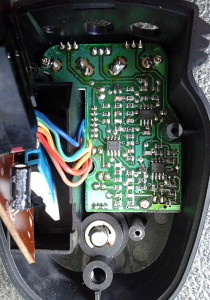 So it is a lot more complicated than what you would expect from a stereo tremolo. Um. I don’t know what to say. The drive part sounds pretty awful with its broken sounding clipping. As a huge disadvantage, we also have a volume boost when effect is activated. Only good feature is the ramp. This offers fun and wild modulation speed changes that are gradual, not instant. This unit has gained some status, but why.. Beats me. Nice novelty toy, but not by far a good, usable effect. If a real Leslie sounded like this, i have a hard time believing anyone would have ever used one for anything. 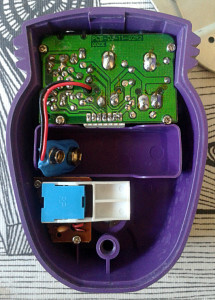 To sum it up – this definitely has something inside that we don”t see every day in pedals. But that doesn’t make it any more good than what it actually is. A novelty toy. 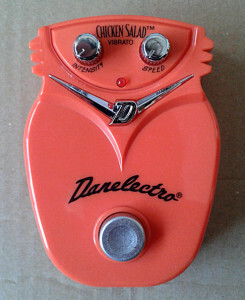 Danelectro DJ-15 Chicken Salad Vibrato from Mini series in plastic housing. Made in china around mid 00’s. Where tuners and couple others in this mini series are just bad, there are a number of great units. This one is the greatest deal. 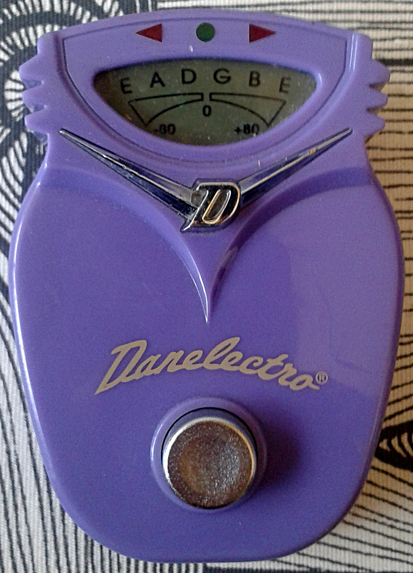 Cheap vibrato effects are scarce, so when Dano released their miniature take on the classic Uni-Vibe with ridiculous price tag, it was bound to become instant classic and a hit. I do not have any idea how many of these have been sold, but i believe the number is big. I managed to grab mine as a new unit from one german retailer. It didn’t come too cheap, but for really good effect, the price can’t be an issue. These seem to sell for a reasonable prices on auction sites too, but usually there are many people bidding on them. 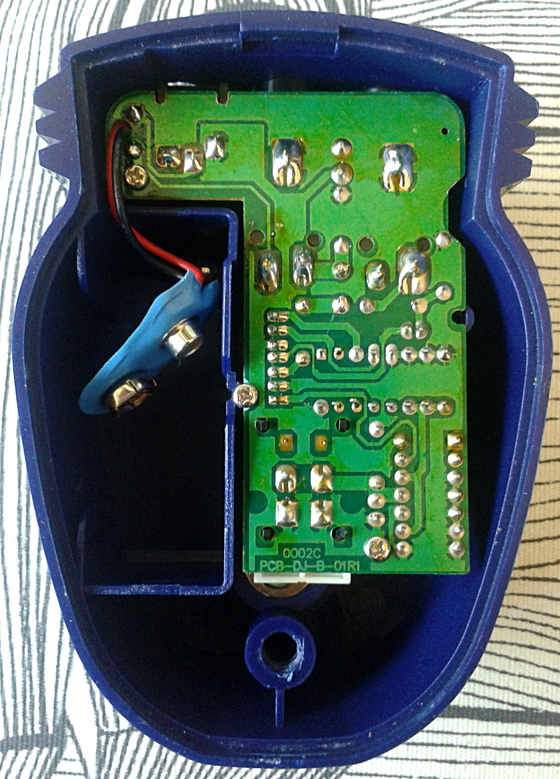 If you do a web search for this, you’ll find a number of discussions on how to rehouse and true bypass the unit. This may be a good candidate for these changes, as will the Tuna Melt Tremolo. Boards and work quality are similar to others in the series, meaning that there isn’t too much to write home about. I did spot a schematic floating around the web. I’m not sure if the changes noted in the schematic are for the factory units, but the drawing itself. 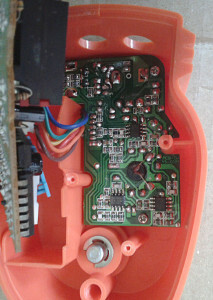 If the lamp type has been changed during the production, this would make my unit the post-2004 unit as the black blob in the main board seems to be a LED. Looking at the schematic, there are four LDR stages that create the modulation. LFO part is made up in manner that’s very effective. But hey, that LFO looks rather familiar to me. Yup. It’s the same configuration we’ll find in original Uni-Vibe. There are some values that aren’t verbatim, but the function is more or less the same. 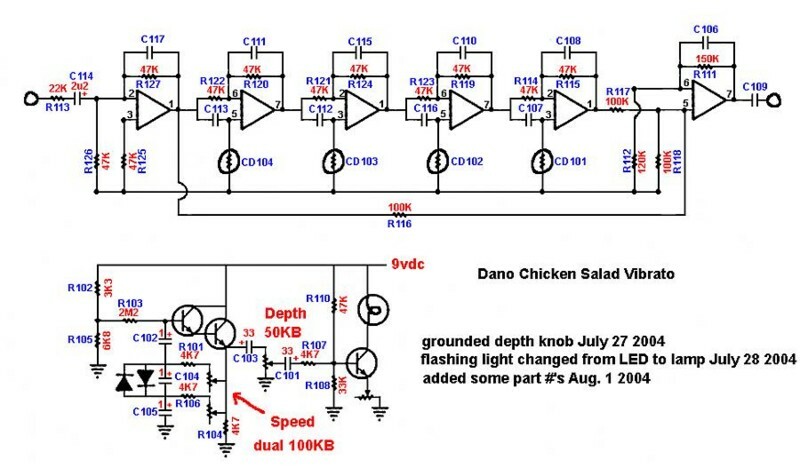 Even the modulation stages correlate between these two designs, even though the Uni-Vibe uses transistors for those stages and Chicken Salad does the same thing with dual opamps. So. 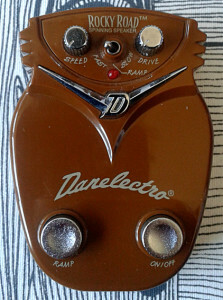 As usual with Dano designs, the similarities are there, while the circuit isn’t exactly straight up clone. To sum it up, the Chicken Salad is your awesome chance to have Uni-Vibe sounds for a very reasonable price. 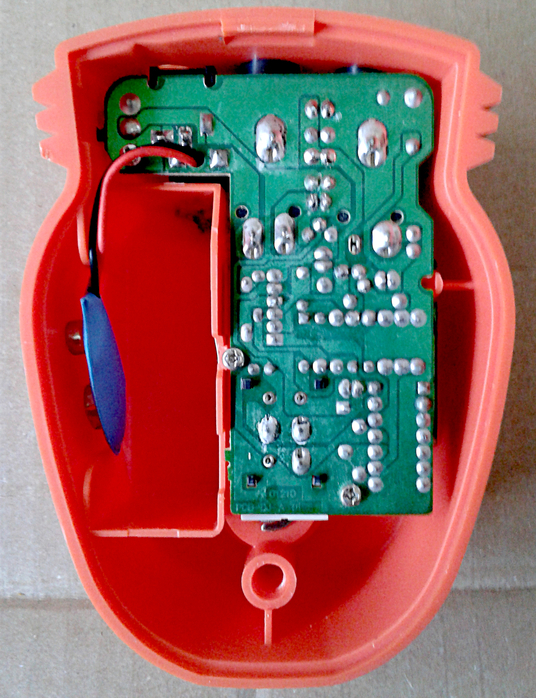 It is all plastic and not too well made with its standard Dano electronic switching. But if these things do not scare you, it’s a very nice score. Wobbly and warm with slight breakup on some depth settings. 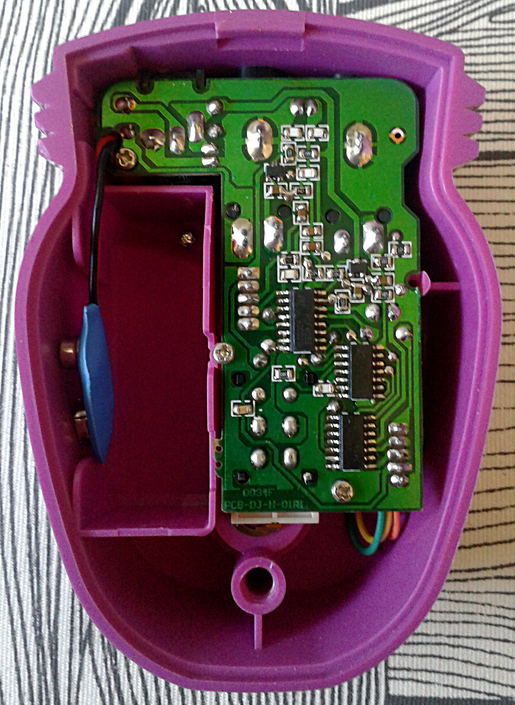 Not squeeky clean, but that’s part of the appeal on Uni-Vibe sound. So yes, it sounds good. And it’s a vibe as any vibe, without any obvious flaws. Range of he controls is sufficient and goes from mild to wild. Can’t say much more. This sounds like very expensive and great effect in a small plastic housing. And it comes with a great price. How can you not love it? 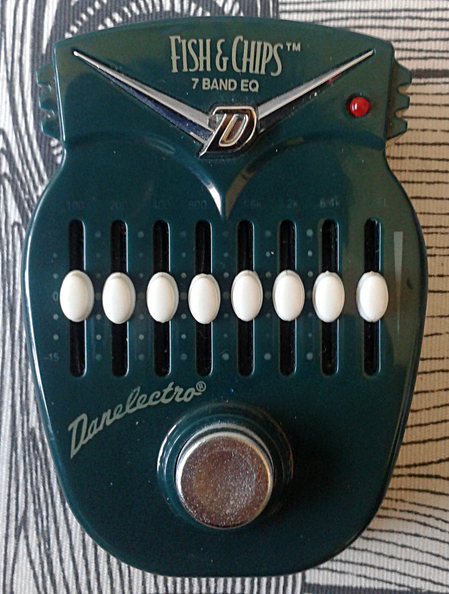 Danelectro DJ-14 Fish & Chips 7-band graphic EQ from Mini-series. Made in china around mid 00’s. The first thing that comes to mind is the Boss GE-7. Could this be one of those simple redesigns that feel and work like the design that it mimics? Sure does feel and work like it. Yes. This is a very close approximation of your big brand 7-band EQ pedals. Sure enough. Anyone could compose a graphic EQ with little engineering skills through a careful studying. So even if the frequencies are close to any other brand’s design, i would still not call this a complete ripoff. All SMD boards with unusual battery-in-the-middle box layout. There are other with this arrangement too, but the sideways battery slot is more common for the series. Clear and clean. Cuts and boosts when and where needed. Usability for this unit is very high. Pedal board-wise, the footprint is small and the standard Dano electronic bypass isn’t that horrible either. Good, clean sounding EQ with good range for the controls. This is one of those Dano Minis that should not be overlooked. 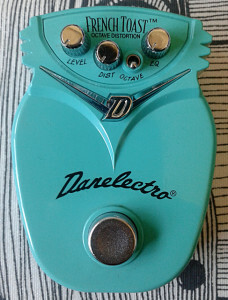 Danelectro DJ-13 French Toast Octave Distortion. Made in china around mid 00’s. This one is one of the more classic designs in the series. 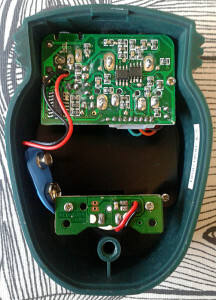 The internet reveals that the design is 1:1 with a classic fOXX Tone Machine with added standard Dano Mini series electronic bypass switching. In other words, it is a four transistor fuzz that features a switchable octave up. There are a few schematics available, here’s one from Gaussmarkov. Looking at the schematic shows an gain stage at the input, followed by a transistor stage that is responsible for the octave up. This stage uses two germanium diodes to mangle the signal in octave mode. Diode arrangement isn’t completely different to one found in latter version of Roger Mayer’s Octavia, while the setup leading to those diodes is. On this point we have our “gain” control. Yup. You can call it what ever you want, but it is simple volume control setting the level for the next stage. 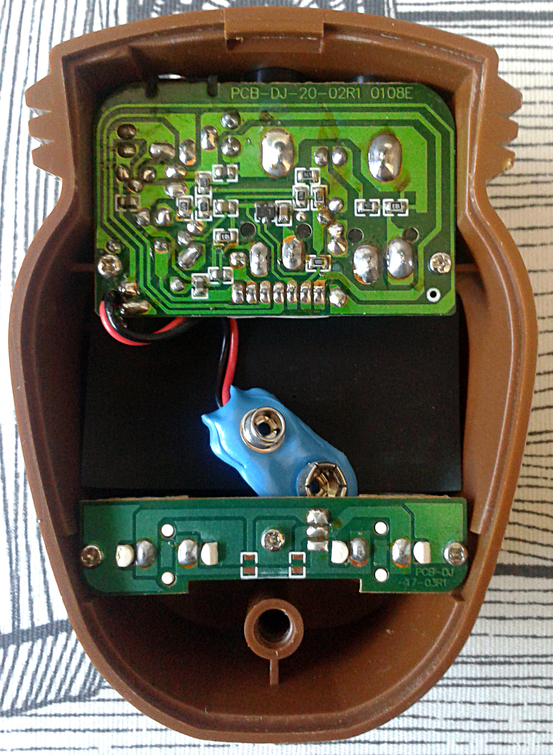 After that there’s one more driver stage pushing the tone control, which isn’t completely different to one found in Electro Harmonix Big Muff Pi. Not completely alike either. Finally, there is one more gain stage before pushing the signal to the the final volume control. There have been numerous boutique clones of the Tone Machine around for years, but seeing one coming in this price range by big brand was new and exciting to me. This, in addition to Chili Dog Octave (and a few others), are the greatest offerings in Mini Series. 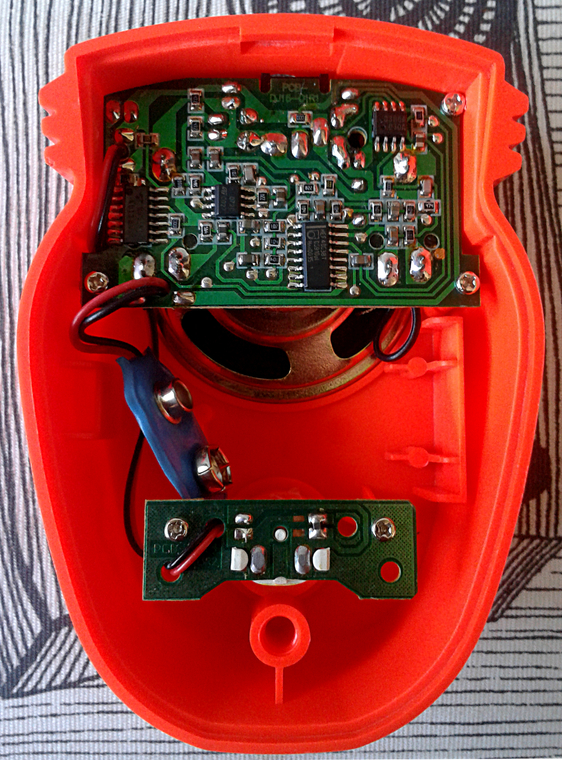 Definitely recommended pedal – if you can look beyond the plastic housing..
Wild and great. Amazing redesign if the Tone Machine. Mean, piercing up octaves. 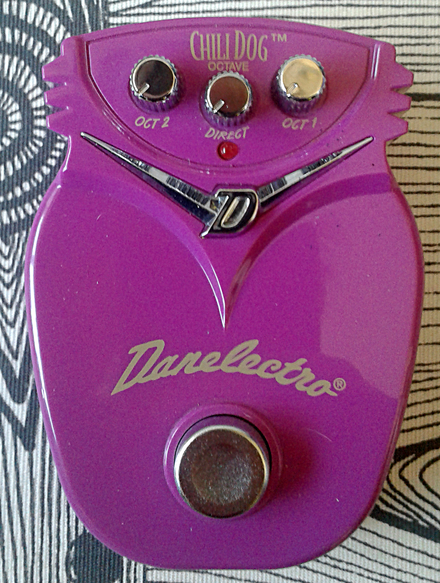 It’s in no way clean or dull, but lively with tons of harmonics, for both non-octave and octave modes. For the price – this is the closest you’ll get to having a classics Tone Machine sound. 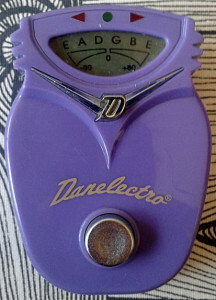 Danelectro DJ-25 Blueberry Muffin Chromatic Tuner from Dano Mini series. Made in china around mid 00’s.. 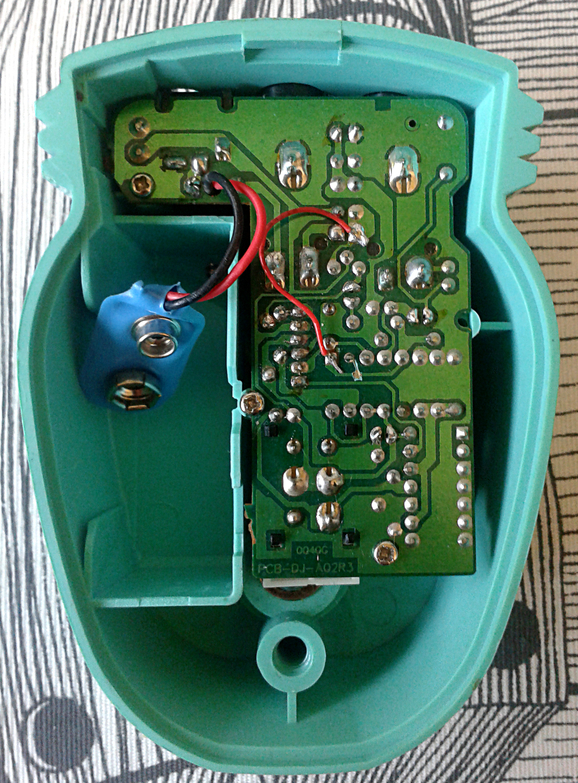 So this is the “fixed” revision of the Lemon Pitcher tuner pedal, the first one i called utter crap in the series. The colour of the unit is pretty close to DJ-11. The main visual difference is the “#” on the display. Well. Does the chromatic remake save the tuners for the series? You guessed it. No. It doesn’t. It’s similar to its predecessor, offering slightly higher accuracy and half note support. Still the dark illuminated old school LCD display still makes the unit completely unroadworthy. 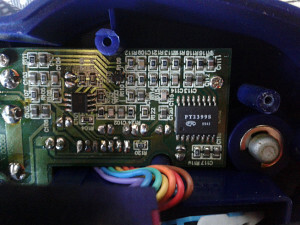 The greatest single thing that offers any interest is the use of the same PCB for the lower buffer board. Tuning results feel are more accurate and the needle seems more stable when compared to Lemon Pitcher, but none of those do not address the biggest issue of dim LCD display. So yes. 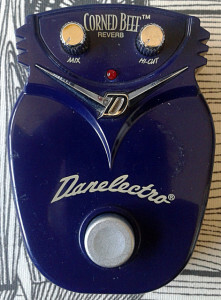 Danelectro tried to make up for the mistakes with Lemon Pitcher. But failed again on this chromatic revision. On the brighter side, this one stands pretty well against DOD Tuna. As a tuner it doesn’t, but for usability? No. There isn’t enough of that to mention either. I can only think of one reason to buy one – You’d need to be collecting the series. For a tuner you want to use full time? Try anything else, or make your life easier by coughing up the needed amount of cash for a Boss or TC Electronic tuner. 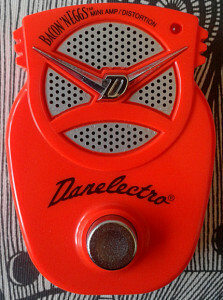 Danelectro DJ-12 Chili Dog Octave from Dano Mini Series. Made in china around mid ’00s. For one of the coolest mini series boxes. There are quite a few that are simply 1:1 ripoffs of higher end brand designs. 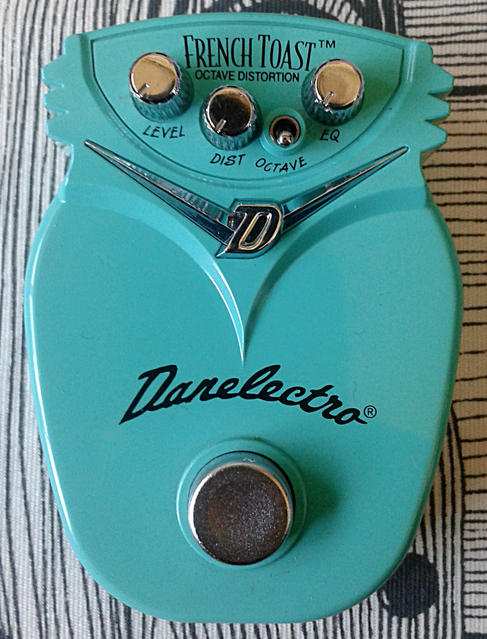 It seems that mainly Boss and MXR have been hit hard by the Dano design team. Granted there are others too, but for this one.. I’m pretty certain that the design is derived from Boss OC-2 Octave. Only it’s about a half in size and squeezed in with tiny SMD components to make that happen. As there are no distinct differences in sound when compared against OC-2, i felt little enthusiasm in opening the whole unit up. Circuit is big enough that Dano engineers had to use both boards to accommodate everything. 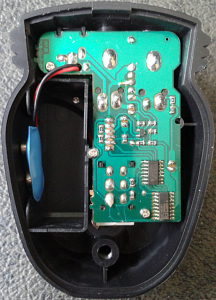 On many Minis, the bottom board only houses electronic bypass switching and sometimes in/out buffers. As you can see, that number of CMOS flip-flops isn’t used only for the switching. 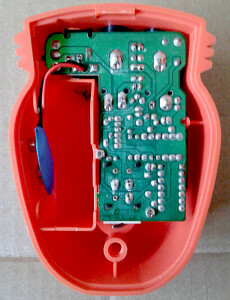 As with many other units of the series, the downsides are plastic housing and buffered Dano bypass switching. All the rest? An underestimated diamond in the rough. As for the controls, the layout and feel of them is exactly one to one with OC-2. There is your dry signal level, plus own mix controls for one octave down and two octaves down. To put in in one word, Sweet. Sweet. Haunting, fat and the tracking is neat with occasional wandering thought. Like the flip-flops forget the signal they are getting in and head to south instead of west. The best tracking can be achieved with playing single notes around 10-15th fret. For chords this isn’t very useful, just as its Boss big brother. It offers quite clear down octaves that could come handy in number of occasions. For its cheap price and extremely high fun factor, this unit should be at least tried out. Playing with this one at home will result in severe brain melt, probably not as severe as with DOD BuzzBox or modded MXR Blue Blue, but still. Severe. Danelectro DJ-4 Corned Beef reverb from Mini series. Made in chine around mid 00s. Mini reverb? Idea sound solid. As i was closing in at finishing off my Mini collection, there was very little i could do but acquire one. There are many digital reverb designs around and usually their circuit footprint is relatively close the one of Spinosaurus. So either Danelectro had done the impossible by squeezing a reverb design in a box of this size, or there must be some pitfall in there. Opening the bottom plate shows that bottom PCB houses only the electronic bypass switching components. Have they managed to cram a digital reverb design to the smaller top board? No. They have not. Checking the top board shows PT2399S. I had a gut feeling about this, mainly due to low price of these units. Usually reverbs of any kind are expensive – even the ones that are from those low end series of many big brands. This sort of explains everything. Sadly, Corned Beef is not a true reverb in anywhere else but the marketing spiel. So the “reverb” is in fact a fixed delay that is made to mimic reverb sounds with short feedback and delay time. It may not be a true reverb, but it’s still a nicely designed PT2399-based SMD board. Controls do not control the reverb characteristics at all. There are simply mix and hi-cut knobs. Mix is obviously mixing the “reverbed” signal in with the clean and the high-cut seems to be a simple low pass filter with roll-off point controlled by a pot. True. It sounds a bit reverbish, but not much. However, it’s not eve remotely close to any of the real digital reverbs around. Anyone familiar with the PT2399 sound can probably spot it being used just by hearing what it sounds like. As a short delay-like pedal, this could be useful. As a reverb? Nope. You need to cough up those bigger bucks for an unit to satisfy that need. 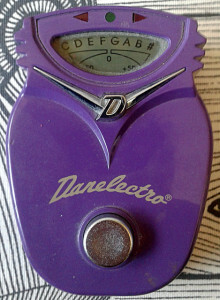 Danelectro DJ-11 Lemon Pitcher Tuner from Danelectro Mini Series. Made in china around early 00’s. Okay. I’ve been harsh on only few Mini series pedals. Most of them are not bad enough to deserve any harsh words. Then there is this. In my experience – any brand that produces usable tuner pedal won’t ever fail on that design. So why this one failed and needed a revision (DJ-25)? Size is ok, no denying that. But in reality, what are you going to do with tuner pedal including an old school LCD display and dim lights? Nothing. 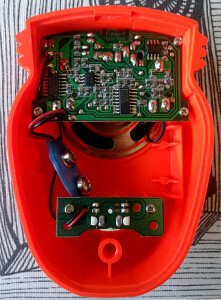 Even if we disregard all the plastic unroadworthiness, we are still left with a tuner pedal that is not sensitive enough and hard to use in anything else than daylight. Gee. I wonder why this design flopped in sales. This and DJ-2 distortion are definitely two worst designs in the series. Stay away. I do not recommend this for any purpose. If it was even a bit more accurate and sensitive.. But it isn’t. 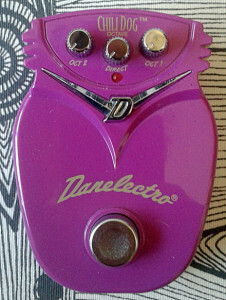 It is pedal version of those bad, plastic little tuners that some might use for tuning their acoustic guitars. And due to the fact that it is a pedal with no microphone, one can’t even use this on acoustic guitar..
As it is a tuner, it doesn’t exactly sound like anything. Maybe it just slightly cuts your highs due to standard mini series bypass buffering. To sum this unit up – bad. That’s the only word to describe the unit truthfully. Entries (RSS) and Comments (RSS). 55 queries in 0.225 seconds.